In my quest for long-wearing eye makeup for my oily, mono-lids, I’m always on the lookout for a good quality liquid liner. My current favourite is the Paul & Joe Liquid Liner which I’ve been using for the past year and is still going strong. 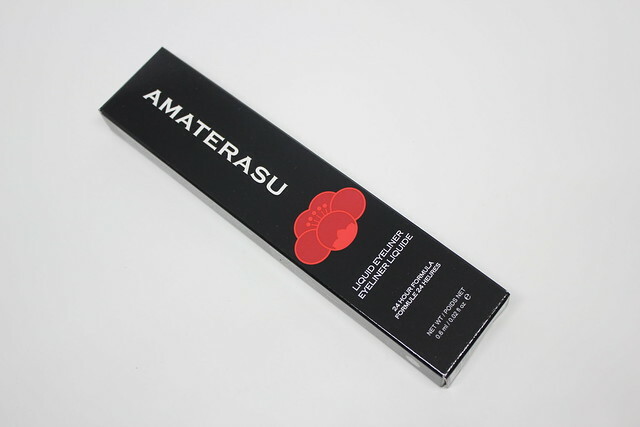 I was recently contacted by Vancouver-based but internationally-renowned beauty brand Amaterasu (previously known as Geisha Ink) to try out their popular Liquid Eyeliner. After reading that it has a brush tip applicator, I quickly jumped on the opportunity to see how this matches up to my beloved Paul & Joe. 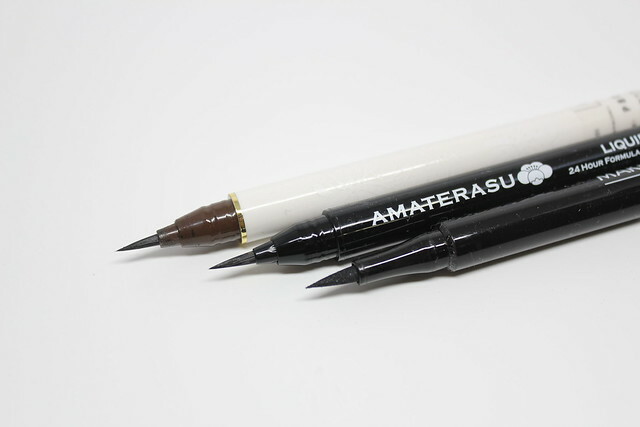 The Amaterasu Liquid Eyeliner (C$30/US$24) is available in black and espresso. Like I mentioned above, it features a brush tip applicator that’s very fine. The applicator is flexible enough to easily draw its way around my lash line, but is firm enough to get deep between the roots of my lashes to create the most sultry lined look. Application is an absolute breeze and I was able to get a cat eye done in under 10 seconds per eye. The formula itself is also very easy to work with, as it is very black and with a matte finish. I don’t have to go over the line too many times to get a deep black line. The liner itself is very fluid, but dries quickly so that you don’t have to hold your eyelids half open to wait for them to dry. The most impressive thing is the wear. My Paul & Joe liner is my go-to liner for when I want a long-wearing line, but the Amaterasu Liquid Eyeliner is now my new best friend because it wears even longer than the P&J without smudging. 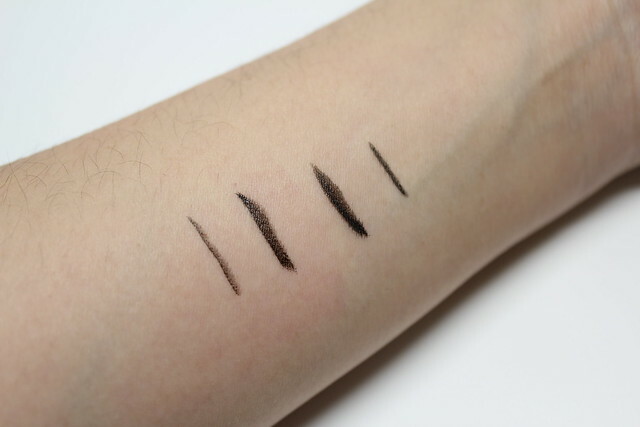 The Amaterasu Liquid Eyeliner does claim 24-hour wear, which I have not tested out and do not plan on test out, because lasting through a whole day from morning to night without smudging is already good enough. I also compared this to the Make Up For Ever Graphic Liner which has a felt tip applicator. The major differences were that the Amaterasu liner’s brush tip liner gave me a lot better control in where I applied my liner whereas the MUFE’s felt tip applicator was firmer and difficult to use when drawing a softer line. 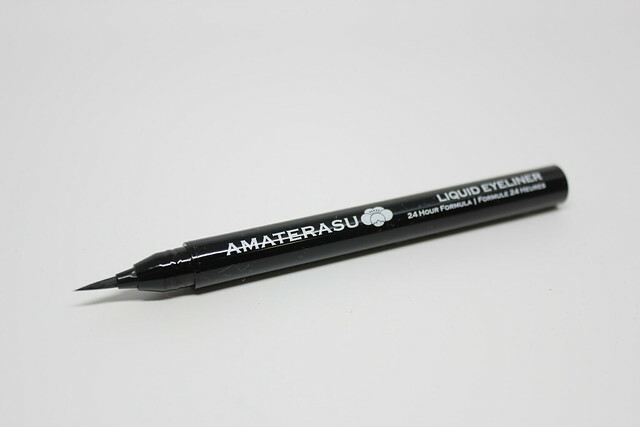 The Amaterasu liner also had much better wear time and was more smudgeproof. Of my three preferred liners (i.e. ones that didn’t smudge upon 10 minutes of applications), the Amaterasu Liquid Liner is my newfound favourite, followed by the Paul & Joe, then lastly the Make Up For Ever. 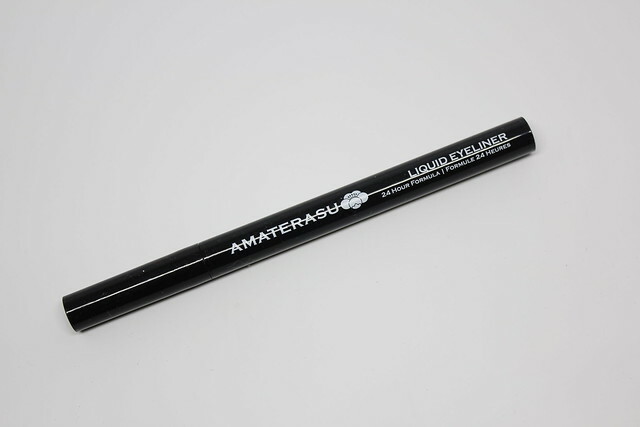 If you also suffer from mono-lids that can get oily and wreck havoc on your eyeliner, look no further than the Amaterasu Liquid Liner! Where to we buy this great eyeliner? Sounds pretty amazing if it’s even better than the MUFE! I’m just not a fan of the felt tip pen – it’s way too hard for me to get an even line and wing. I’ve been winging my liner every weekend now because I just can’t get over how easy it is to use this! Oooo I’m always interested in a good brush tip liner! My favourites are the Stila and Clinique ones. My eyelids are not that oily I think, the problem is just the way my lids fold up that facilitate the smudging. I don’t get any smudging with either Stila or Clinique!